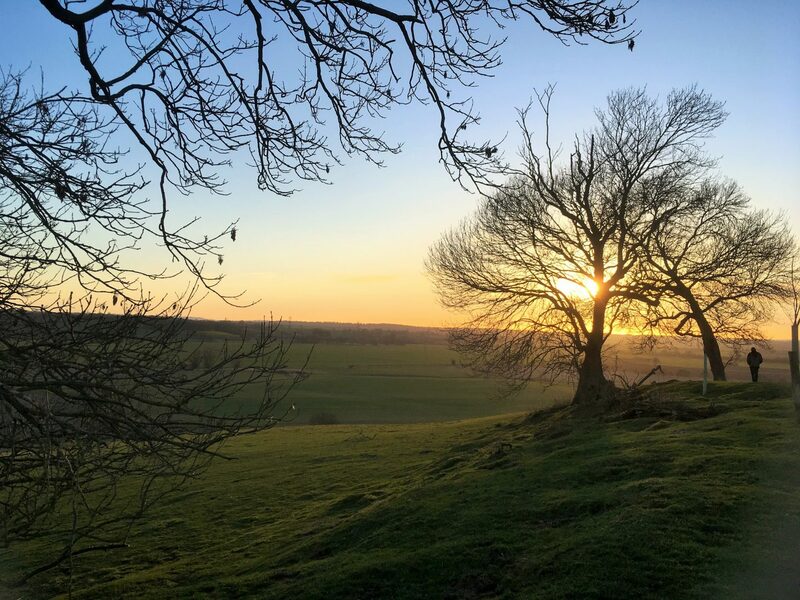 For two February half terms in a row, we have explored the High Weald area of south east England which straddles East Sussex and Kent. Even in winter, there is a great range of family-friendly attractions. 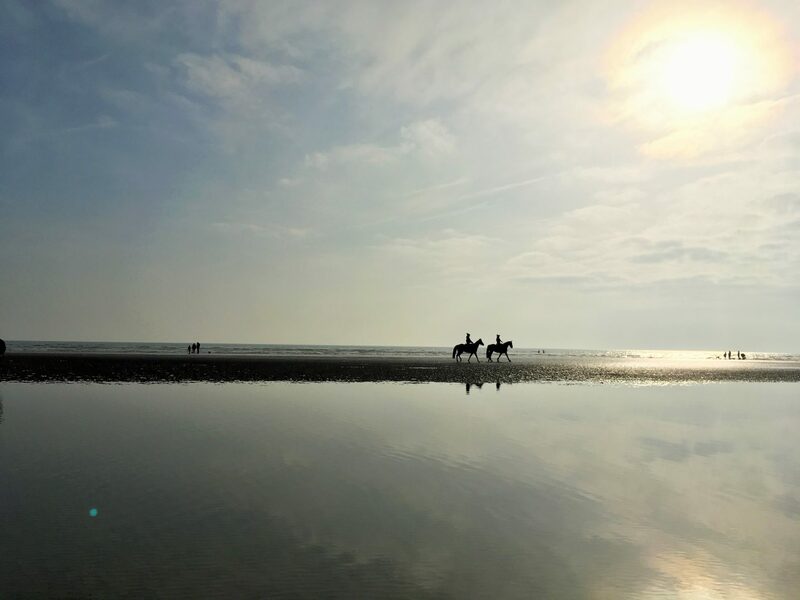 You can learn about the region’s smuggling past, visit one of the country’s most impressive medieval castles and enjoy an early evening sunset on Camber Sands beach. 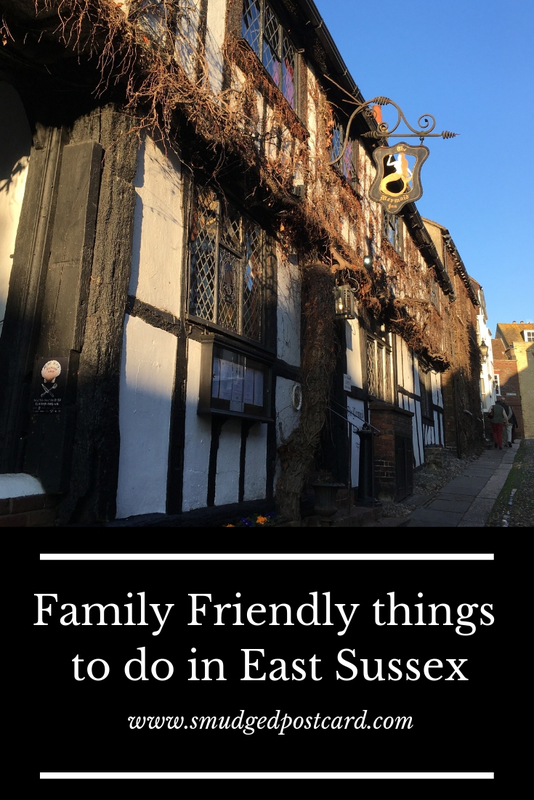 There really is something for everyone so I’ve put together some of our favourite family friendly things to do in East Sussex (with an essential visit across the border into Kent too). What better way to arrive at a castle than by steam train? 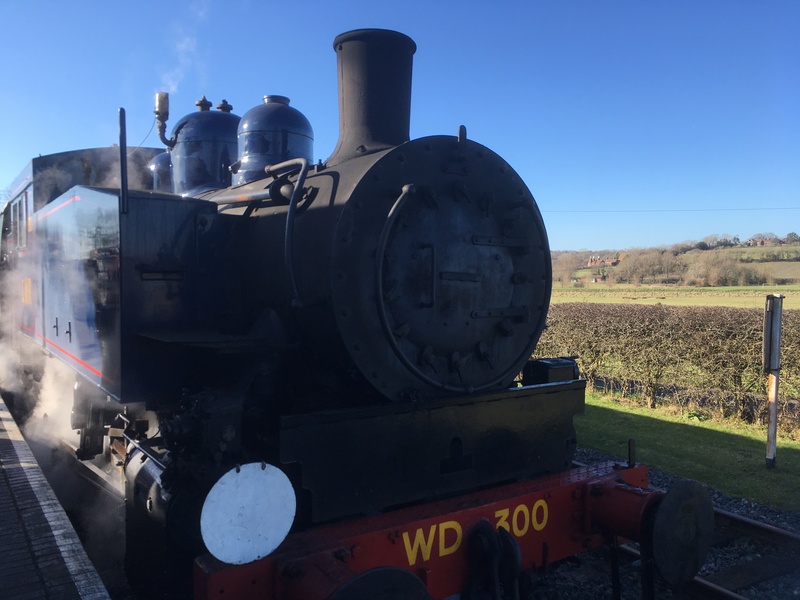 The Kent and East Sussex Railway takes visitors from Tenterden in Kent to Bodiam through the incredibly picturesque countryside of the High Weald Area of Outstanding Natural Beauty. The steam train chugs past meadows and gently rolling hills, the journey is a great way to get a feel for this remarkable landscape. Kent and East Sussex Railway: our transport to Bodiam CastleThe National Trust’s Bodiam Castle is the stuff of childhood dreams: it features a proper moat and an imposing gatehouse complete with original portcullis. There are towers to clamber up and tunnels to explore. 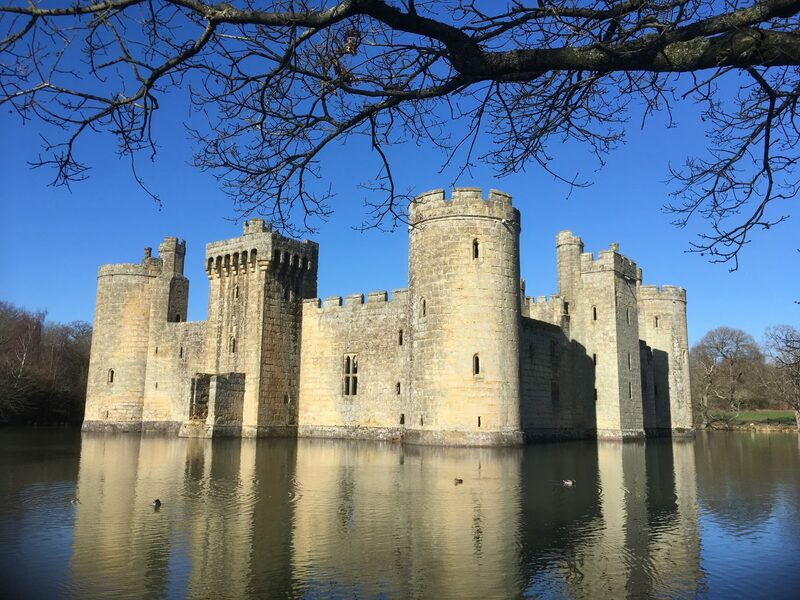 I enjoyed explaining to my boys how the sewage system once worked at Bodiam Castle: small children were “employed” to clear blockages from the narrow chutes which carried the waste from the toilets to the moat. On our visit to the High Weald in 2018 we stayed in a cottage at Great Prawls Farm, set deep in the High Weald countryside, midway between Tenterden and Rye, just over the border into Kent. It was a perfect spot from which to explore the region and to enjoy the stunning countryside. 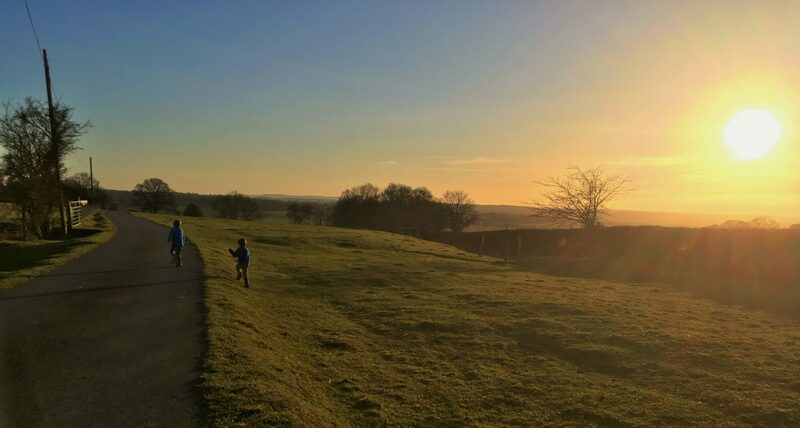 We witnessed spectacular sunsets and the children loved tearing across the fields and clambering over fallen trees. From the farm, country lanes wend their way past old oasthouses and pretty cottages. There are very few major roads in this part of south east England, I hadn’t expected to discover such an expansive pocket of tranquillity. Now surrounded by marshland, Rye was once an important medieval port with several thriving industries: ship building, wool making and smuggling (the latter partly brought on by the high cost of wool). The seawater has since receded some two miles, but the seafaring character of the town is still very much alive. Rye is small enough to be visited in a day from London but it’s at its most atmospheric at night. Wander the streets after dark and it’s easy to imagine smugglers sneaking along the cobblestone lanes. Of course, now when you peer into a half timbered inn or shop window on famous Mermaid Street or Rope Walk, you’re unlikely to find a smuggler peering back at you, but we had fun pretending. 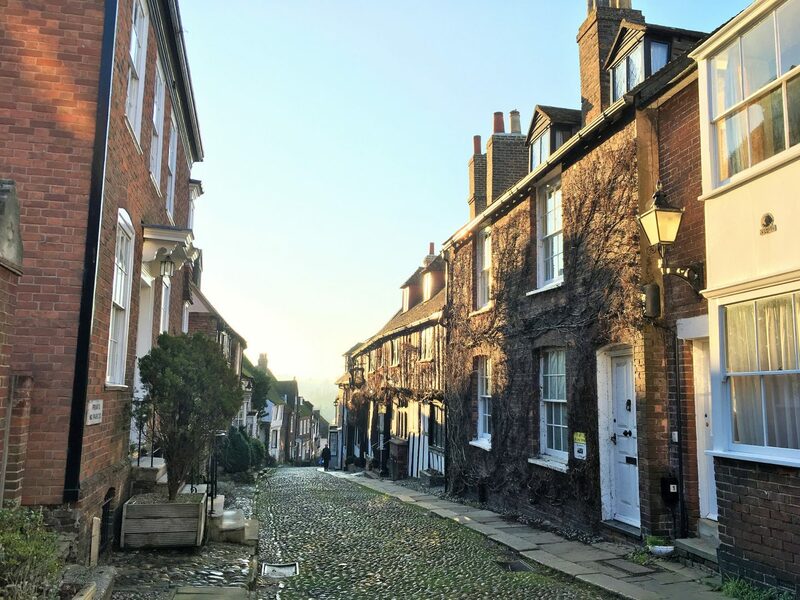 Rye is now a popular haunt of Londoners escaping the big smoke for a weekend away. The taverns and inns are now upmarket restaurants, boutique hotels and fancy interior shops. 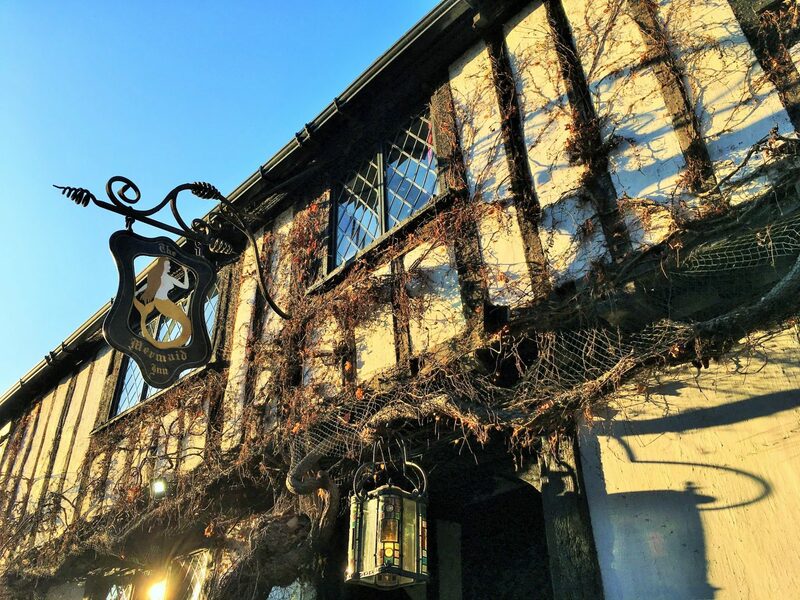 We stayed at the rather lovely George In Rye which sits right in the centre of the town. It has a number of family rooms and we enjoyed delicious meals there. The hotel is however quite popular with couples so we were glad on our second night to discover the very relaxed Italian restaurant Simply Italian which was packed with noisy families like ours. Rye has a great little museum in Ypres Tower. The Tower has had various uses down the ages since its construction in the 13th century. Once part of the town’s defensive walls, Ypres has been used as a private residence and as a jail before taking on its current guise as a museum. Ypres Tower has a useful model of Rye showing the changing coastline and the town’s fortifications and you get a good view of the surrounding countryside from the balcony. My boys enjoyed learning about the various smuggled goods on display at the Tower, dressing up and handling the heavy weapons and listening to sea shanties. They didn’t fancy hanging around (excuse the pun!) in the cell displaying the gibbet – a type of gallows, complete with skeleton. 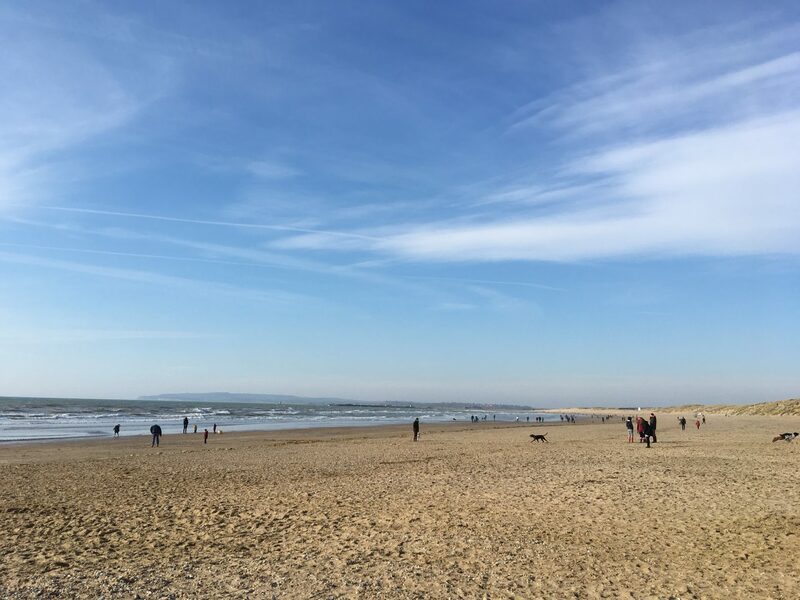 Just a short drive or bus ride from Rye, you’ll find Camber Sands. Backed by sand dunes, Camber is a huge expanse of sand which seems to go on forever (in reality, it goes on for about 3 miles). The weather was so lovely this year, that we visited two days in a row. On the first day, we arrived just before sunset when the beach was quiet and the light was incredible. The following day we visited the beach just after breakfast to find it packed: with families, horse riders, dog walkers and couples. It was very heartening to see such crowds out enjoying a winter’s morning on the beach. There were a few cafes open for that essential morning coffee and we spent several hours building sandcastles and hunting for shells. 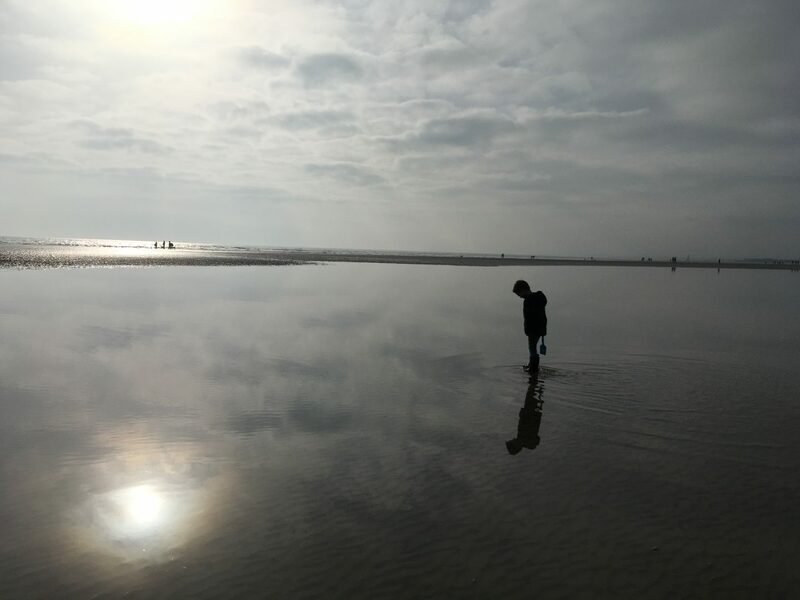 There are a couple of car parks at Camber Sands, opt for the second one (coming from Camber), as the toilets there are open in winter. For a quick lunch, there are two good cafes a short drive from Camber Sands (the ones next to the car park aren’t so great). We ate at Beryl’s Cafe (delicious sausage sandwiches and roast dinners) but I also liked the look of the cafe at Salts Farm Shop. For another smuggler experience, we loved visiting Smugglers Adventure at Hastings. There’s a funicular railway in the centre of the town to take visitors to the top of West Hill where you follow signs across the park to the unlikely looking entrance in the hillside. Tunnels take you deep into the hill through an extensive cave system which was once used for storing tobacco, tea, gin and other contraband. It’s a fascinating insight into what was once a thriving industry exploited by all members of society. At Smugglers Adventure, you’ll find life-size waxwork figures and gory tales of life in 18th century Hastings. After an hour or so in the dark, it was rewarding to race down the many steps back into Hastings and enjoy fish and chips at one of the fishy eateries. 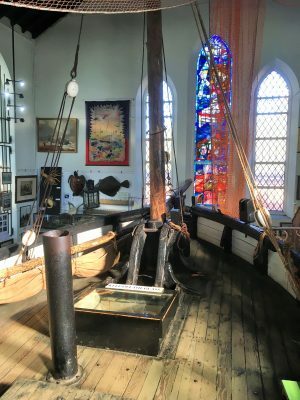 After lunch, we visited the Fishermen’s Museum where the children clambered onto the deck of the Enterprise, a 100 year old fishing vessel. 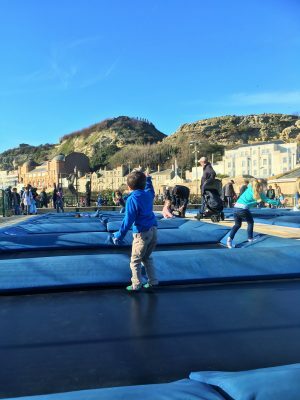 Next time, I’d like to have a wander through the Jerwood Gallery but with such good weather we spent the rest of the day outside on the promenade where there’s an excellent playground as well as a trampoline park and various other attractions which made a bit of a dent in our wallets. Now, it’s important when you’re on a family trip, to remind your children that it’s a holiday for the parents too. With a climate not dissimilar to that of the Champagne region, East Sussex and neighbouring Kent are home to a good number of vineyards. We visited Chapel Down in Kent to sample some of the region’s famous sparkling wine as well as some locally brewed gin. 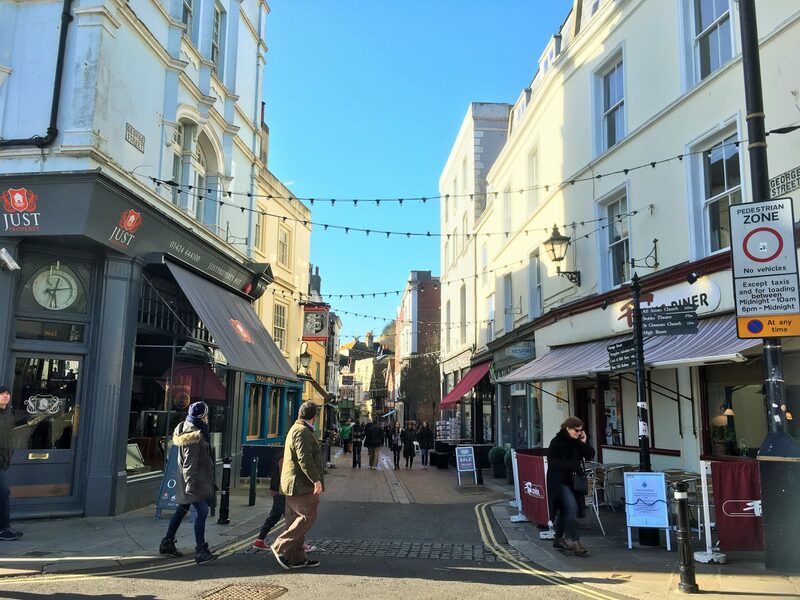 Have you visited East Sussex? Which family friendly things do you recommend doing? Let me know in the comments below. Hi, as you’re driving around next time pop in to Cats Protection in Chelwood Gate. We have cats, obviously, but also a great cafe and shop, donkeys, a lovely lake and nature trail and access to the beautiful Ashdown Forest where Winnie the Pooh had all his adventures. We have lots of free parking and entry, very tasty home made cakes and our famous shortbread cat biscuits! Dungeness is next on our list! Lucky you! I was really surprised by how peaceful it was given how near it is to big motorways and London. I’m definitely going to Dungeness next time, it keeps getting missed from our itinerary!